For the first time, security aspects regarding urban planning have already been taken into account during the design phase. Software identifies and analyzes specific risks, quantifies damages and proposes solutions. VITRUV supports city planners at all stages of their work and helps optimize existing infrastructures. Scientists will present their technology at Trade Fair BAU 2017 from January 16-21, 2017 in Munich at the Fraunhofer booth (Hall C2, Booth 538). For the first time in the history of mankind, more than half of the population lives in cities. According to a current forecast by the UN, the share of the urban world population is expected to grow to about 60 percent by 2030. This corresponds to a doubling since the 1950s. By then, most people will be city residents. A similar development can be observed in Germany, and many experts expect the situation to intensify in the future. Nevertheless, from an urban perspective, the civil safety of the city residents has so far been a peripheral issue. In the face of climate change, terrorism or social conflicts, urban planners have to deal comprehensively and methodically with this issue. At the BAU 2017 trade fair the Fraunhofer Institute for High-Speed Dynamics, Ernst-Mach-Institut, EMI from Freiburg will present VITRUV, a software that enables the integration of security issues directly into the process of city planning. The researchers developed the software in the EU project of the same name. It can analyze the structure of a complete urban area in terms of safety aspects already during the design phase, in order to identify weaknesses. The scientists have been able to radically simplify the process of structural risk analysis. Until now, the approach has been very complex: individual assessments and expert opinions have had to be evaluated. VITRUV supports urban planners in all three phases of their work. In the concept phase, a rapid assessment of the safety-related topics is performed. In the planning phase, the tool provides insights into vulnerability, weaknesses and specific areas of risk. Finally, in the detail planning, it develops concrete solutions to minimize risks. Through the iterative approach, city planners can optimize their designs step by step, ultimately opting for the best one possible. During the conceptual phase, the software performs an empirical risk analysis. The tool uses historical data that is collected from existing knowledge databases, such as Securipedia, in order to assess the vulnerability of certain areas. Statistical frequencies are visualized according to the type of threat, the threatened object, the region and the exposure. In the two planning phases, VITRUV analyzes urban structures as well as individual buildings and provides insights into the expected consequences for people, buildings and infrastructure in the event of damage. "With the software, you can go through all the points where something could happen for a particular region and overlay the results," says Dr. Alexander Stolz, Head of Departement Safety Technology and Protective Structures at Fraunhofer EMI. 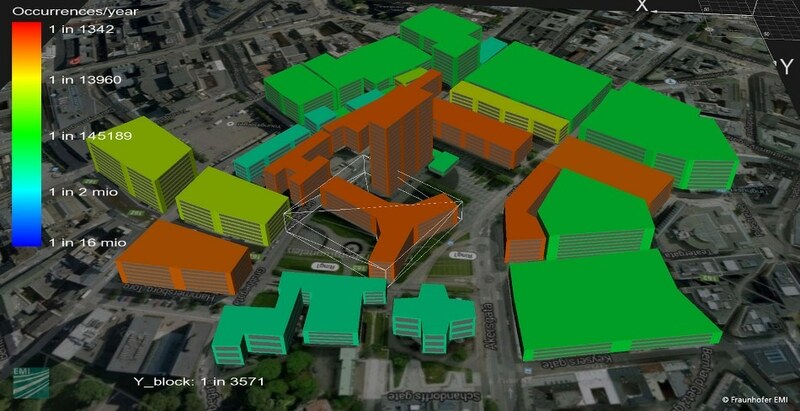 "This helps identify the neuralgic points where serious damage could occur in urban planning. By reorganizing the structure, such as through a new arrangement of the buildings or changing their use, the risk can be minimized." A validated physical engineering model calculates possible damages using quantitative risk analysis. In the process, VITRUV considers different scenarios, such as earthquakes, explosions or terror attacks. When calculating the possible damage, different performance criteria are available for the individual buildings or elements of the transport infrastructure, including the number of persons affected, as well as structural or monetary damages. The software also supports city planners in determining appropriate protective measures. A number of such provisions which can minimize the impact of an incident and optimize road or infrastructure reuse are already implemented in the software, providing decision-makers with a basis for cost-benefit analysis. The measures make it possible to improve the urban resilience and the robustness of cities against disturbances. In particular, existing infrastructures can be optimized with VITRUV by means of the latter characteristic. On the one hand, city planners can identify and quantify risks, on the other hand, they can determine how effective and expensive individual protective measures are to strengthen existing buildings in a targeted manner.